In iTunes, I've ordered the playlist by Release Date -- i.e. I want to listen to the oldest podcast episodes first. The order is correct in iTunes but when I sync to my iPhone the order is jumbled. Currently, I have five episodes in this playlist -- ordered by release date they're A,B,C,D,E. On my iPhone, they're ordered B,D,C,E,A. There's no sort order that's obvious to me -- not sorted by name of episode, name of podcast, length of episode, date added, etc. Any solutions to ordering smart playlists on the iPhone? Update: This is likely an iTunes 9 bug. There's lots of discussion about this over on Apple.com. "I did find another workaround that works better for me. If you create a smart playlist that is based on another smart playlist, then the track order of the former will be correct on the iPhone. So what I did was to create a first smart playlist that included all podcasts. Next I created a second playlist where the first rule is that it contains everything from the first playlist (Playlist is). The result is that the second playlist is still updated automatically in iTunes, but it does not seem to get updated on the iPhone . . . and that's probably where the bug is. Anyway that second playlist will keep its ordering from iTunes. This isn't quite as much of a pain as flipping the Live Update box on and off, at least for me. " To make sure your smart playlists gets copied to your iPhone in the exact sort order you have done in iTunes, just right-click on the smart playlist, and choose "Copy To Play Order". Re-sync with your iPhone, the playlist should now be copied and the songs will be in the exact order you wanted. Make sure to turn Shuffle off. I had this problem with iPhone OS 3.1 and iTunes 9... definitely seems like a bug. In my case, turning off "Live Updating" on the smart playlist took care of it. Disabling that didn't have any effect on my workflow and just meant I needed to mentally keep track of where in the playlist queue I was. This was fixed in iTunes 9.0.1 which was released today. Run the updater and you should be set. I found another workaround for this issue: link 2 smart playlists and they can both have "Live updating" checked. This allows the playlists to update automatically when listening in iTunes or when you sync. I have a "Good Podcasts" playlist that does all the hard work. It includes podcasts where the playcount is 0 and the where the podcast name is any of the podcasts I like to stay current with (about 30 podcasts). Then I have a "GP2" playlist where the only criteria is "Playlist is Good Podcasts." I manually rearranged both playlists (which, of course, have the same podcasts on them). When I sync to my iPhone, GP2 retains its order (and Good Podcasts does not). The Live Update feature on the iPhone only works on the primary playlist, however. If I play one of these podcasts on the iPhone, its play count is incremented and it drops off the Good Podcasts playlist. However, it remains on the GP2 playlist. Obviously, the iPhone isn't smart enough to do live updating on GP2. This does not matter to me because I listen to the podcasts in order from the beginning of GP2. 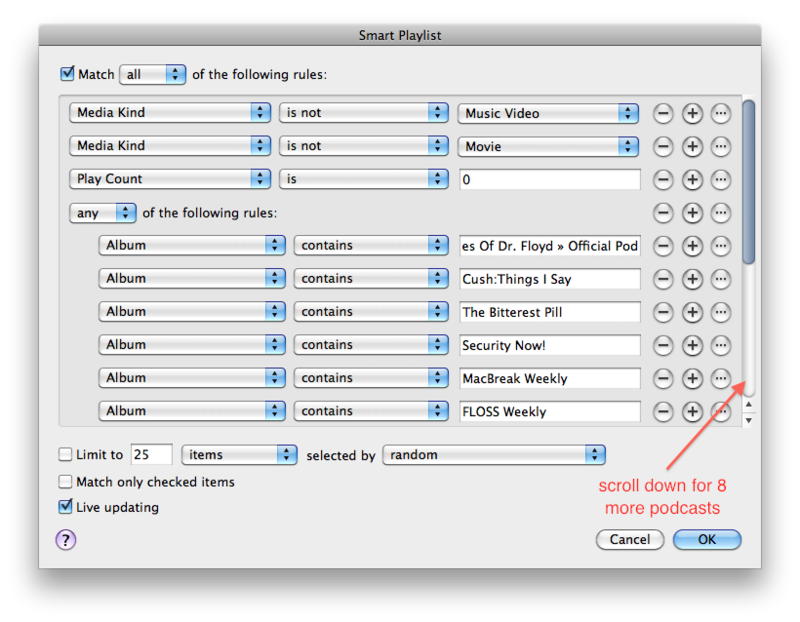 Set the attribute "Media Kind" to "Podcast" in your smart playlist criteria. Not the answer you're looking for? Browse other questions tagged iphone itunes playlists smart-playlist or ask your own question. How do I make an iTunes smart playlist by track rating, not album rating? iTunes - how to create really RANDOM playlist?